When it comes to dessert, simple and small is good! I got these little orange dessert cups at a thrift store and we use them a lot. 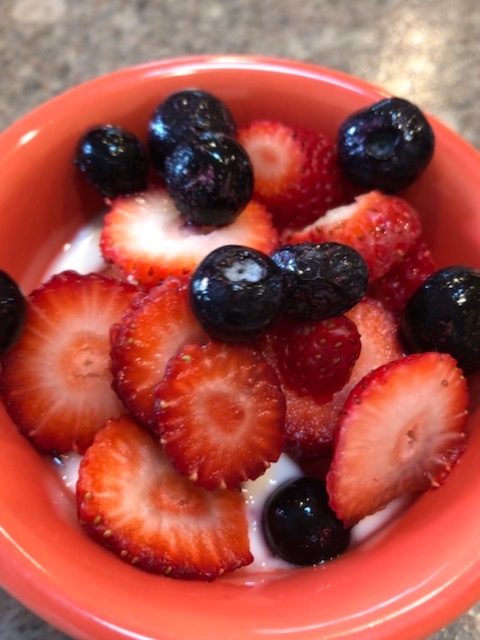 Pictured here is the simple vanilla yogurt and berries “dessert” that I served after our dinner last Sunday. It’s fresh and light and gives you a little sweet in your mouth without being heavy and so sweet that it leaves you in a sugar coma and or sick to your stomach later! My Granny used to have one graham cracker after a meal to get that sweet sensation. What ideas do you have for keeping things simple? I’d love to hear them! We have started having “treat” Friday instead of treats or desserts everyday. It was getting out of hand. This has helped the kids understand that we don’t need treats all the time and it gives us something to look forward to as a family. I love that idea! Yes, our culture of sweet treats has gotten crazily out of hand. Good for you Rene and thank you for sharing! Honestly. I have never introduced the idea of a treat after dinner! But I would totally go for a yogurt and fruit cup after dinner everyday! Well, good for you, I’m so glad! Some people grow up with that expectation and it’s surely hard to stop expecting it I guess. Love you Stacy. Thanks for chiming in.